Back when I was in high school one of my obsessions was the early 20th century; not really World War I or II but the history, music, architecture, design and art in very few places other than the magnificent ocean liners could you find all of it at the same time! Well maybe the Chrysler Building ;). This was post 1906 which I remember as the year when the RMS Mauretania was launched. From memory at the time (what I used to read, I'm not implying I was there!) 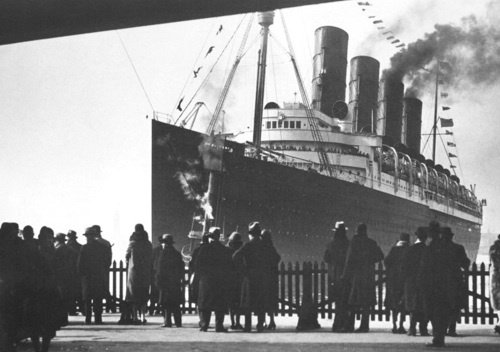 Cunard had appealed to the British government for a loan to build two new superliners in response to Germany's eclipsing of the UK as the dominant transatlantic passenger carrying nation. From my biased perspective as a tech guy, what was more significant though was their propulsion systems. The Lusitania and Mauretania were the first full sized ships to use steam turbines instead of reciprocating engines which at the time was a huge gamble, but one which ultimately paid off; the turbines were lighter, smaller and faster and allowed each to win the Blue Riband transatlantic crossing record. The Olympic and Titanic which were built later were larger, but in many ways were inferior with older style engines and rudders. The Lusitania served as a transatlantic liner until World War I broke out and she was sunk by a torpedo while acting as a hospital ship. The Mauretania served as a troop ship in World War I and as a passenger liner until she was withdrawn from service in 1934 and scrapped in 1935. Okay I cheated and looked up those years.